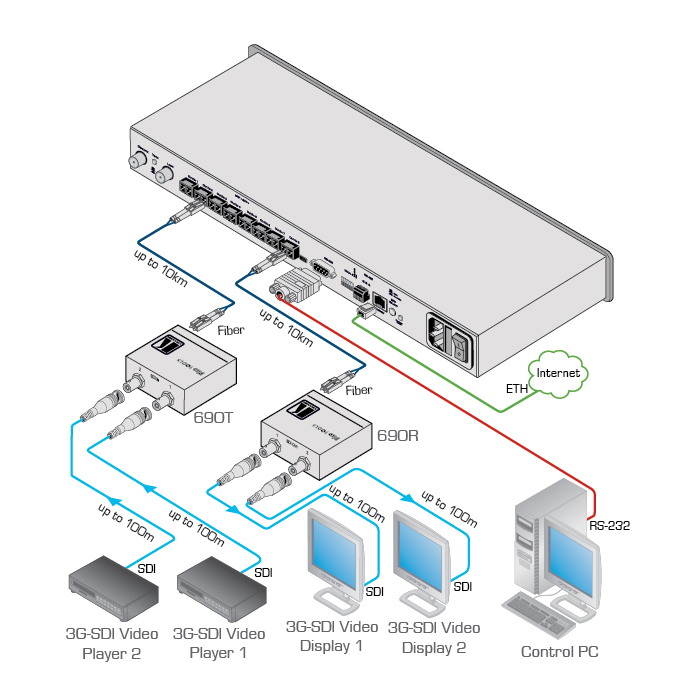 The VS-88FO is a matrix switcher for 3G HD-SDI video signals over fiber optical cable. The unit can switch any or all inputs to any or all outputs. Max. Data Rate - 3Gbps. Optional SFP Modules - Maximum of 4 can be installed. Minimum of 1 is required. Active Input Reporting - Each input button on the front panel automatically lights up when the unit detects a video signal on that input. Red indicates a standard definition (SDI) input signal and blue indicates a high definition (HD-SDI) input signal. Multiple Memory Locations - Stores multiple switches as presets (salvos) to be recalled and executed when needed. Take Button - Executes multiple switches all at once. Vertical Interval Switching - Compliant with SMPTE RP-168. Compatible Transmitter & Receiver - 690T & 690R. Flexible Control Options - Front panel, RS-232 (with K-Router Windows-based software), RS-485, Ethernet and IR remote (included). Range - 2-40km depending on SFP modules installed. Standard 19" Rack Mount Size - 1U. Rack "ears" included.